Latter-day Saints are promised blessings such as peace, strength, and increased spirituality when we attend church regularly and go to the temple often. But for those who live with some form of mental illness, such as anxiety or depression, it is not always easy or comfortable to attend church and go to the temple and feel the effects of those promised blessings. “If things continue to be debilitating, seek the advice of reputable people with certified training, professional skills, and good values. Be honest with them about your history and your struggles. Prayerfully and responsibly consider the counsel they give and the solutions they prescribe. If you had appendicitis, God would expect you to seek a priesthood blessing and get the best medical care available. So too with emotional disorders. Our Father in Heaven expects us to use all of the marvelous gifts He has provided in this glorious dispensation” (Jeffrey R. Holland, “Like a Broken Vessel,” October 2013). “Seek pleasure in small and simple things by noticing the texture of a flower, the flavor of a favorite food, or the beauty of a birdsong. Practice mindfulness or another relaxation technique. Allow your thoughts to turn to God as you give your mind and body time to rejuvenate” (lds.org/mentalhealth). 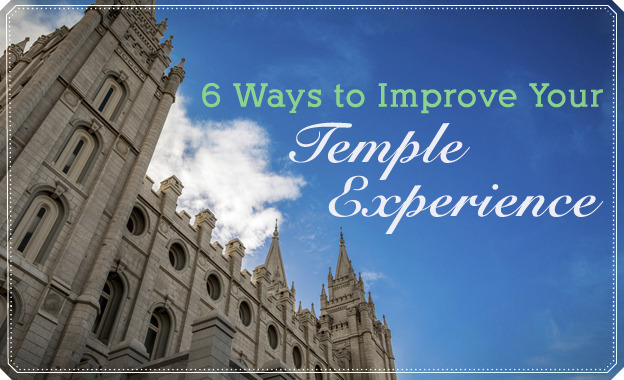 It can be difficult to enjoy church or the temple when you are feeling anxious. Since anxiety often involves thoughts about the past or the future, it can be helpful to find a way to return to the present moment. If you are feeling anxious at church or in the temple, find something concrete to focus on using the senses (sight, touch, taste, smell, sound) that will bring you back into the moment. For example, it can be helpful to focus on listening to a speaker’s words during a talk or lesson, noticing colors in the environment, feeling your feet grounded to the floor, or focusing on the hymns or prelude music. These strategies, though seemingly simple, can help you return to the moment and divert anxiety-provoking thoughts. “Social connections with family, friends, and others in your community can increase your happiness and physical health and may reduce the incidence of mental health challenges. Remember, it’s the quality of the relationships you have that’s important, not the number” (lds.org/mentalhealth). “When I was a young man, I served as counselor to a wise district president in the Church. He tried to teach me. One of the things I remember wondering about was this advice he gave: ‘When you meet someone, treat them as if they were in serious trouble, and you will be right more than half the time’” (Henry B. Eyring, “In the Strength of the Lord,” April 2004). When we focus on looking for someone who may need a friend at church or helping others to feel more comfortable at church, we can be blessed to feel greater peace ourselves. This is much easier said than done and can be uncomfortable (especially if you’re dealing with social anxiety), but approaching church or temple attendance with the mindset of “Whom does the Lord need me to serve?” (or even adopting Paul’s question from Acts 9:6—“Lord, what wilt thou have me to do?”) can be a helpful way to move through anxiety. As you focus on others, it is also important to care for yourself and your needs. Remember to be kind to yourself and don’t metaphorically “run faster than you have strength” (see Mosiah 4:27). Check out this article for more ideas about finding a balance between selflessness and self-care. “God has not forsaken you. Even Christ, in the Garden of Gethsemane, felt the Spirit withdraw for a time, but then God sent an angel to support Him . . . . Remember what you knew. Find an old journal entry that describes a spiritual experience or talk to someone you trust” (lds.org/mentalhealth). Since it can be difficult to feel the Spirit at church or in the temple if you are struggling with feelings of anxiety, it is important to remember times when you have felt the Spirit in the past. Everyone feels the Spirit differently. Whether it’s reading scriptures, listening to testimonies, singing the hymns, or sitting quietly and pondering, seek to find and recognize moments at church or in the temple when it is easier for you to feel the Spirit. “Above all, never lose faith in your Father in Heaven, who loves you more than you can comprehend. As President Monson said . . . : ‘That love never changes. . . It is there for you when you are sad or happy, discouraged or hopeful. God’s love is there for you whether or not you feel you deserve [it]. It is simply always there.’ Never, ever doubt that, and never harden your heart. Faithfully pursue the time-tested devotional practices that bring the Spirit of the Lord into your life. Seek the counsel of those who hold keys for your spiritual well-being. Ask for and cherish priesthood blessings. Take the sacrament every week, and hold fast to the perfecting promises of the Atonement of Jesus Christ. Believe in miracles. I have seen so many of them come when every other indication would say that hope was lost. Hope is never lost. If those miracles do not come soon or fully or seemingly at all, remember the Savior’s own anguished example: if the bitter cup does not pass, drink it and be strong, trusting in happier days ahead” (Jeffrey R. Holland, “Like a Broken Vessel,” October 2013). “While the causes of mental illness are complex and debated among professionals, we know that mental illness is not a result of sin or weakness of character” (lds.org/mentalhealth). Some religious people might say that’s not the OCD, that’s Satan. And I don’t know, they have similar voices sometimes and maybe their messages overlap. But the fact remains that I feel this way and it’s up to me to decide if I let it control my actions or if I stand up to it and take a risk. By taking a risk, I mean, going to the temple even if I feel that maybe I’m not as worthy as I could be. Taking the Sacrament even if I haven’t perfectly repented of something. Praying even if I don’t think I am 100% in tune with the Spirit. “Anxiety disorders may be a lifelong struggle for some, but with training in how to change distorted perceptions, thoughts, and feelings, they can become manageable. We can all benefit from understanding anxiety better. If you are struggling, you can find comfort through the gospel of Jesus Christ, assisted by professional counseling if needed. And in His Church you can find support and acceptance as we all strive together to become one and strengthen one another.” (Lyle J. Burrup, “Anxiety and Anxiety Disorders,”Ensign).